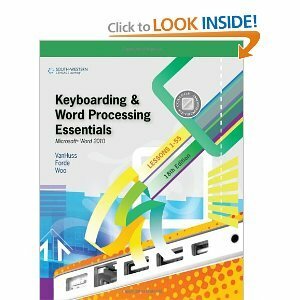 The Eighteenth Edition of KEYBOARDING COURSE, LESSONS 1-25 is packaged with the market-leading KEYBOARDING PRO 6 software to help readers develop fundamental skills by mastering the alphabetic keyboard, top-row numbers, symbols, and the numeric keypad. South-Western College Keyboarding offers a proven, time-tested approach that enables readers to develop a strong foundation in basic keyboarding. Each lesson is clearly focused, well structured, and designed to provide step-by-step training and reinforcement to allow readers to quickly build their skills and confidence. Dr. Susie H. VanHuss received her B.S. degree from the University of Southwestern Louisiana and her MBA and Ph.D. degrees from Indiana University. Her teaching specialties include business communications, administrative systems, and personnel management. Her work, published by Cengage Learning, includes textbooks in communications, keyboarding and word processing, and office technology. She has written numerous journal articles and has served on the editorial review boards of several leading business education journals. Donna L. Woo is an Instructor and Department Coordinator for Information Systems/Office Automation for Cypress College and Associate Director of Education at Pacific College. She received her B.A. and M.A. in Business Education from Michigan State University and earned her Ed.D. from Nova University. Her industry experience includes work for both IBM and General Motors. A respected author, Dr. Woo has written several word processing textbooks and has served as a coauthor on several editions of South-Western College Keyboarding textbooks.